With the warmer weather upon us, it’s a good time to think about how you’ll make the most of the coming summer months when you can enjoy the outdoors. While you’re at it, why not get your dog involved in the fun? There’s no one better to enjoy the warm weather with than your best furry friend. So get outside, get fit, and have a great adventure! One of the best ways to get moving with your pooch is to plan some time to get out and enjoy nature. Start by doing some research on the national and state parks near you to learn more about their amenities. Most cabins, picnic areas, and camping sites are dog friendly, although most do require that your furry friend stays on their leash. 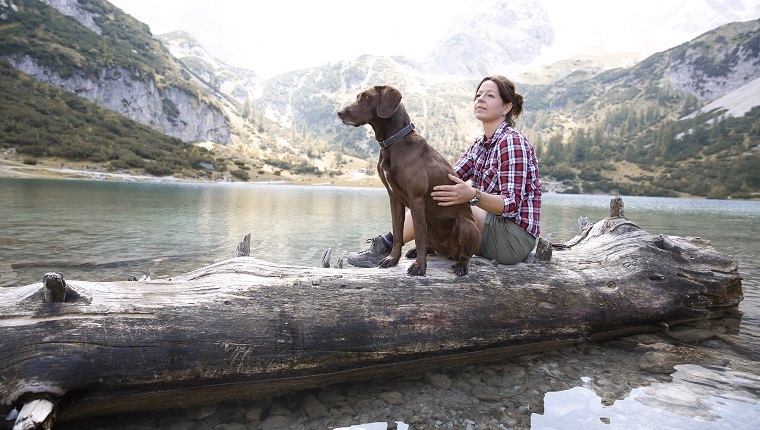 Check out this guide for tips on camping with your dog. Most trail systems are rated in terms of difficulty so that you can plan according to you and your dog’s fitness level. If you’re an inexperienced hiker, be sure to plan a few shorter day hikes to learn your limitations, first. In addition, think about your dog’s needs when you pack your gear. They’ll need fresh water on the trail and a way to drink it, such as a collapsible water bowl. In addition, consider a saddlebag style dog harness so that your canine companion can carry their share of the load while out on the trail. Check out Wiley Pup’s guide on Dog Hiking Harnesses. Another great way to get active with your dog this summer is to enjoy some swimming. 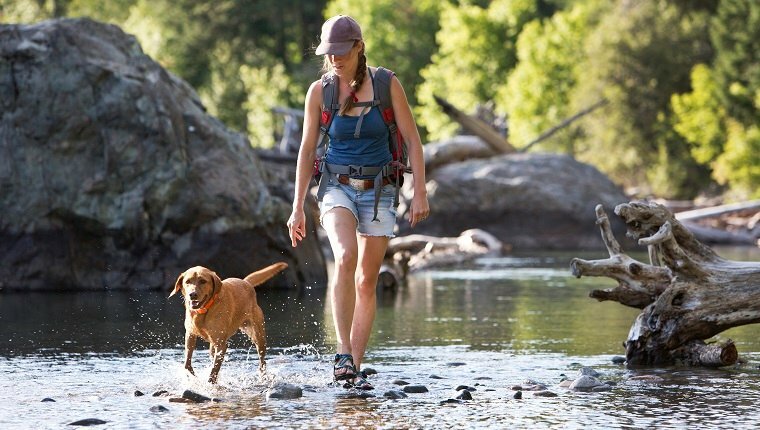 Dog-friendly lakes, beaches, and rivers are all good options. Be sure to pack some floating dog toys for some fun games of swim and fetch. In addition, consider a dog life vest if your pooch is new to enjoying a cool dip. In terms of safety, make sure you follow all posted regulations. Some areas have bacteria or toxic algae blooms that can be harmful and even deadly if you or your dog swim or drink from the water. If you happen to have a securely fenced yard, one of the more creative ways to get active with your dog is to construct a canine obstacle course. A long plank over a bucket makes for a dog-friendly obstacle famous on the agility course for requiring excellent balance and timing. When training your dog for the seesaw, start by having someone hold the high end and slowly letting it lower until your pup gets the hang of the drop. Walk alongside your dog, rewarding often for a job well done. You can make jumps for your homemade agility course out of most anything. Old hula hoops and some stakes make for a fine jump, as do plain old lumber scraps. Place several of these jumps on the course, using the command “jump” right before your dog gets to the obstacle. 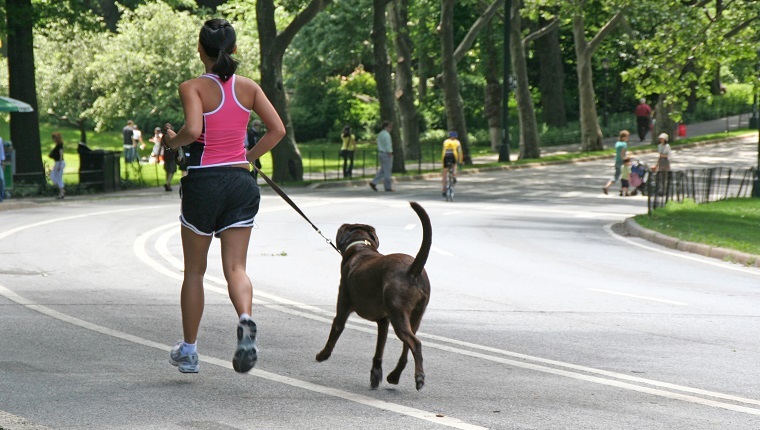 As always, be sure to run the course with your dog–it’s about fitness, remember?–and reward and praise often. Tomato stakes, tent poles, or even sticks can make fun weave poles to train your dog to go in and out like a pro. 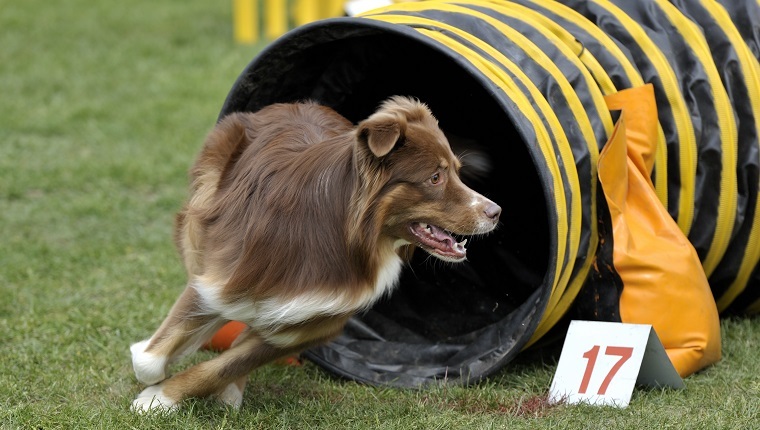 The official AKC agility distance between the poles is 60cm (or 1′ 11.6″). However, if you are just having some fun, it’s okay to make them a bit wider for beginner dogs. Start with just five of these poles and let your dog learn the obstacle well before adding more to increase the difficulty. If you’re looking for a way to get moving and make some new dog-loving friends, then organized dog sports are the way to go. 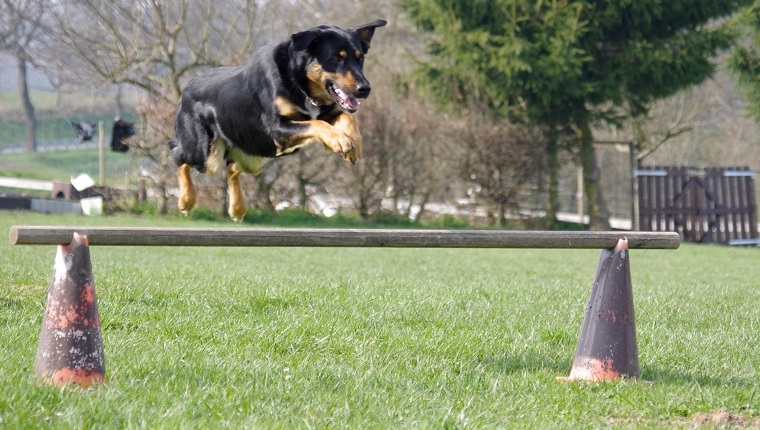 Agility is a good choice if you have a very athletic dog and a time commitment of at least four to six hours a week to train for the various obstacles. Because you will actually run the course with your canine companion, this is a great chance to work on your own fitness goals this summer. This is one of easiest competitive dog sports to learn. It’s a fast-paced game of relay with four dogs on each team, four jumps on each course, and a ball dispensed from a spring-loaded box. If you happen to have one of the several dog breeds that were originally bred for herding, then consider looking into what opportunities may be in your area to let your dog exercise their primal needs to “gather” sheep, ducks, or geese. You can find competitive clubs or local herding enthusiasts by doing some internet research in your local area. This fun game is perfect if you have a fenced yard and a few kids looking for something fun to do on a summer day. Just give each child a small bag of treats. Have one person hold the dog while the kids find a good hiding spot. One at a time, have them call your dog in an excited tone. When your pooch finds them, the kids can give treats and plenty of praise. Another big benefit of this game is that it helps to teach your dog to come when called–a potentially lifesaving skill. Finally, don’t miss out on the motivational qualities that our dogs bring to the table. If you made some resolutions to get more active and are still spending too much time on the couch, then make a commitment for a daily walk or jog with your companion. Track your progress and challenge yourself to build on your success. If you feel like taking a day off, just spend a moment looking into your best buddy’s big, puppy-dog eyes and remind yourself that it’s good for both of you to get moving! 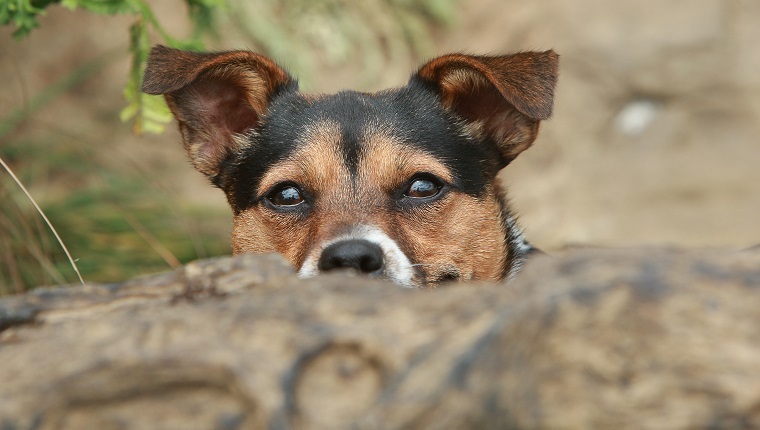 Are you staying active with your dog this summer? What are some of your favorite warm weather activities? Let us know in the comments below! Sharon is a professional writer and received her M.S. in Science and Technology Studies from Virginia Tech. She has worked as a professional dog trainer for over ten years.